Pot Limit Omaha is a game of big bets, big draws and big pots. With each player holding 4 hole cards the number of potential hands that can be made by the river rises exponentially compared with some other forms of poker. 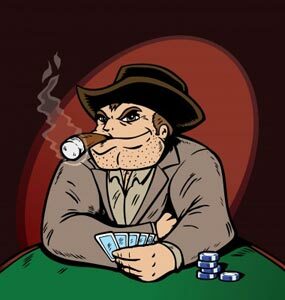 Even with this in mind there is a place for bluffing in pot limit Omaha Poker, but it can be a very costly minefield if you get it wrong. So in this article I’m going to outline 5 key elements to successfully carrying out a Bluff in Omaha. The first factor to consider when looking at bluffing is the pot limit betting structure. The ability to bet the size of the current pot – and to potentially face a re-raise based on the new pot size – means that the bets can be small in the pre-flop and flop betting rounds compared to later streets. The threat of a large turn bet can sometimes mean an opponent will fold a hand rather than call your bet on the flop. Conversely implied odds for hitting a nut draw (for example) are high. This might lead to opponents being more likely to call flop bets when they believe that hitting their hand could lead to a big payout. The flop can thus be a good situation for a bluff, the risk is relatively small and if you are called – particularly in position – you may be able to take a free card on the turn. There are several factors which can determine whether a flop bluff is a positive expectation play. These are examined below and include the texture of the flop, number of opponents and stack sizes. Flop texture is the single most important factor in bluffing when playing pot limit Omaha. The number of draws that your opponent(s) may hold means that flops containing flush or straight draws indicate your bluff is less likely to succeed. The pot limit betting structure also means that your opponents may believe they will be rewarded with a big pot if their draw hits compared to the small bet size on the flop. Conversely flops containing a pair, flops of all one suit and ‘raggy’ flops which contain no obvious draws at all are good flops to bluff. Most opponents will give up drawing to flushes or straights quickly if there is a pair on the board. If you are called with a paired board then slow down on the turn – an opponent who called such a bet is likely to hold a strong hand. Uncoordinated flops, for example K-3-8 all different suits either hit an opponent hard or completely missed them. A bluff on this kind of flop will work a good percentage of the time but again it is important to give up quickly if called or raised. The best number of opponents to bluff is one. As the number of opponents rises your tendency to bluff should decrease significantly. Due to each player holding 4 hole cards the number of ways any one opponent can hit a flop rises sharply. With 3 or more opponents it is safest to assume that someone has hit and pass on the opportunity to bluff. Each Street (Flop, Turn and River) can produce their own opportunities to bluff and factors to consider. Stack sizes are one of those factors to consider. If your flop bluff is for the rest of your chips then opponents do not have to be concerned with facing large bets on the turn and river. Essentially they get to see 2 more cards for the price of one bet and may even have a positive expectation call if drawing to several outs. If the flop is checked through there are situations on the turn and river that can also be suitable for bluffing. One such situation is where a turn card comes that completes an obvious draw such as a flush. If your reads on an opponent indicate that they would normally bet the flop with a flush draw then your position becomes even stronger – a well timed bet often taking the pot uncontested. Likewise a turn or river card which pairs the board can indicate a profitable opportunity – beware of callers on paired boards, you will often find yourself facing a full house when called here. As with all forms of poker the best spots for bluffing in pot limit Omaha are actually semi-bluffs. These situations include times where you have outs that can make you a nut hand if you are called. Flush and straight draws are the obvious examples of this but 2-pair hands can also fall into this category. With 2 pairs you do not mind winning the pot immediately, but have the backup of 4 outs to a full house those times when you are called. This is particularly powerful when you are last to act after the flop – if you miss your draw then you have the choice of whether to fire a second barrel or take a free card that might well give you the winning hand. Are they going to Call Your Bluff? So now you have an idea of the key success factors and considerations to take into account when bluffing in Omaha Poker. It’s time to see if anyone is going to call your bluff.